My cheeks still hurt from laughing during this past weekend’s session with Cheyenne + Ben. It was 40 degrees and Cheyenne went barefoot and braved the cool grass and even colder shadows during our walk to find the golden light. 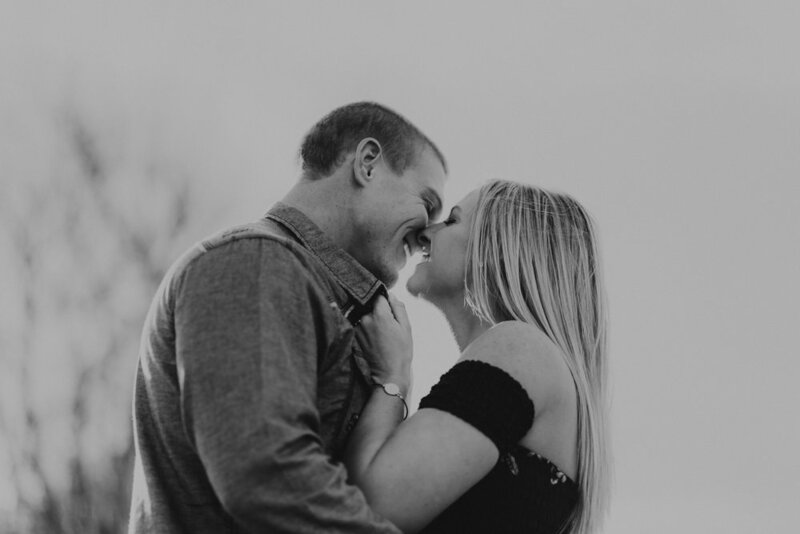 I had such a blast witnessing their love for each other and seeing how “easy” and plain-as-day it showed through their laughter and their images. I hope you enjoy their love story - Cheyenne was kind enough to give me a few pointers on thing’s they’ve learned as a couple while on their journey of love, so be sure to read the whole journal entry! Millennial Love-Story | “A few years ago I had received a Facebook friend request from Ben, and I messaged him asking if we've met because we had mutual friends. We messaged for a few days and then HE GHOSTED ME! How cute right? Rude. Anyways, totally forgot about him and then like a year later I get a follow request on instagram. I'm like wow this name looks super familiar.... then I thought, "OH! This is the dude who ghosted me" LOL. So I accepted, and followed back. I received a message reply to my instagram story which was a picture of a handful of vitamins I was taking. He messaged me & asked "what vitamins do you take?" He did not care, he just wanted to break the ice and it worked! We talked for about a week straight and then went on a date, and the rest is history! 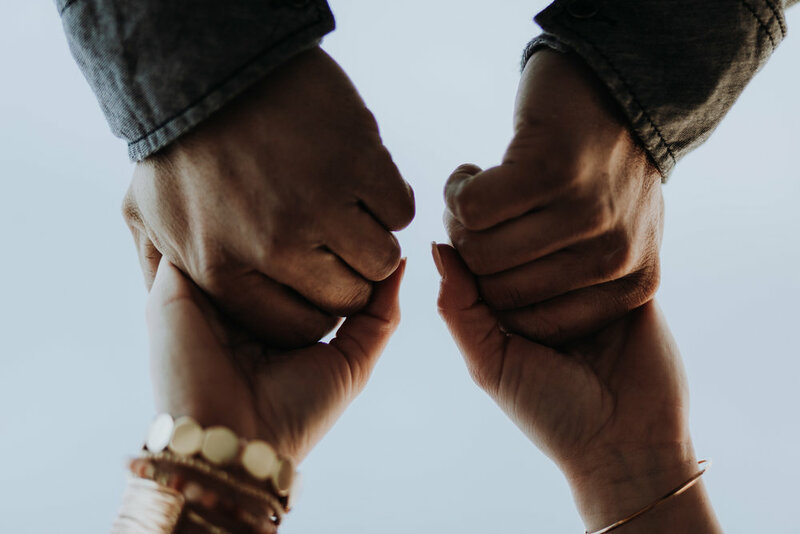 Sure, we get into disagreements or little arguments about stupid stuff like every other couple out there, but it is so easy for us to love each other. This is by far the most easy and passionate love I've ever experienced. We love each other fiercely, and it just comes naturally. I love our love! Most importantly, we both share the love of Christ. He's such a Godly man & encourages me to stay the Godly woman I am. We go to church every Sunday together! It truly is the foundation of our relationship. They always say that people "love the way they want to be loved instead of learning how their partner needs to be loved" - Ben and I luckily share the same love language; but, I am slightly more needy (hehe) We just really know how to love one another the way we need to, and we never feel like we are missing something. Opposites attract! He is the calm, and I am the storm. We balance each other out SO GOOD. I am very outgoing, goofy, wild, adventurous, and loud. Ben is very calm, collective, introverted, soft spoken, go with the flow. He chills me out & keeps me level headed, and I bring out his goofy side while making him branch out in life. As much as we are different we are the same. We share the same hobbies and interests, so it makes life easy and fulfilling. We love to do everything and anything together. I think it's important to have a friendship and relationship combined. People say to date your best friend, but I think you need to date your lover too! We have a really good balance of love/romance, and friendship. I've learned that LOVE IS NOT HARD. It's only hard when we make it hard. Is the thing your mad about going to matter next year, or even next month? No? Well then don't make a huge deal about it. Is the attitude your partner is giving you stemming from the attitude you're giving them that you might not know you even had or were giving off? Did you say something the wrong way? Always think think think before you speak (I struggle with this). COMPROMISE. We all hate it, but it makes the relationship much easier when you stop being selfish and just compromise. SELFLESSNESS. You truly need to not only think about yourself and what you want and need from someone, but to think about what they need and want from you. Always putting yourself in their shoes with any situation. ACTIONS SPEAK LOUDER THAN WORDS- Someone who truly loves you will show you in many ways, but one example I have is funny & stupid, yet really shows what a man Ben is. - I hate when people burp out loud.. I think it's disgusting lol. Ben did it a few times and I finally asked him one day if we could possibly try to not do it around me. Since that day, I have never heard him burp out loud again. Ever. Such a small thing, but wow did it show the things he does to make me happy. So many other situations like this one, with more important things, and I have never had to ask twice. Point blank- Love isn't hard. It's only hard when we make it hard.